This is a soup that is a full meal in of itself. 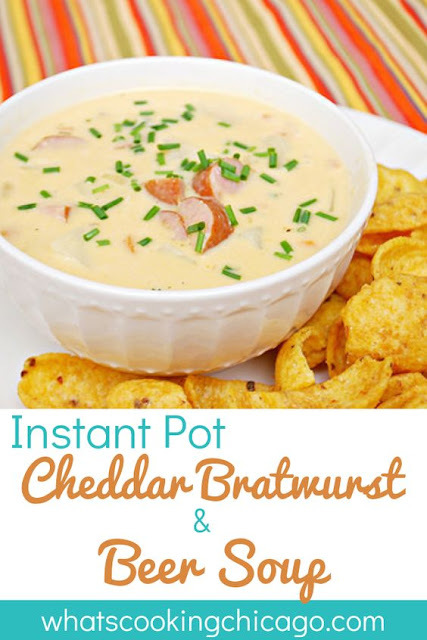 Pair it with some crusty bread or even some Frito Scoop chips to sop it up with, it will definitely hit the spot. The first time I made it was on the stove top and it was wonderful... but took a bit of time. I adjusted the recipe a bit more for some shortcuts to take on prep time and it still resulted in a delicious soup. You can tweak the consistency to your preference by thinning it out with more beer or thickening it up with more cheese. 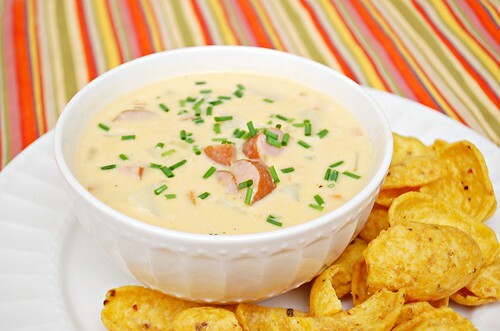 I also made this with a combination of cheddar and monterey jack cheeses for a little smoother soup. If you want the stovetop version, check it out here.... but I've included both the slow cooker and Instant Pot recipes below. Enjoy! In a slow cooker, add potatoes, butter, onion, bratwurst, beer, cream of mushroom soup, brown mustard, horseradish. Cover and cook on low for 4 hours or high for 2 hours. Stir in cheeses until melted through. If you want to thin down the soup, add a little more beer until its as thin as desired. To serve, garnish with chives. Add the add potatoes, butter, onion, bratwurst, beer, brown mustard, horseradish. When the IP beeps after pressure cooking for 5 minutes, allow your IP to naturally release pressure for 5 minutes. While naturally releasing pressure (also known as NPR or NR), the display will reflect numbers counting up from 1. The numbers indicate how many minutes the IP has stopped cooking since it beeped (or how many minutes it has been naturally releasing pressure). No need to touch your IP while it naturally releases pressure. When the display reflects 5 (which is 5 minutes since the IP has beeped), turn the setting on top of your IP to VENTING. Doing so allows the IP to quickly release pressure (also known as QPR or QR). I use a wooden spoon to carefully turn the setting to avoid close contact with the potential steam. You may also want to turn your IP away from cabinets to allow the released steam to escape freely. The pin at the top of your IP will drop when all pressure has been released and it's safe to open. Stir in cheeses and cream of mushroom soup until warmed and melted through.